We tried to get the license plate number of the car pictured at left, but it was too blurry. The car pictured here whizzed by us like we were standing still on I-95 this morning (and we were doing 10 over the speed limit ourselves). I drove, my wife took the picture, so fret not about safety here! 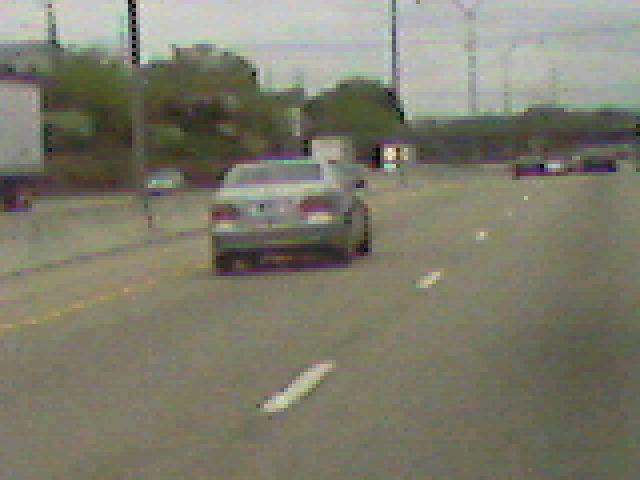 Anyhoo, you might see a dark blue blotch on the left side of the license plate here. That blotch is a "badge" bearing the State of Rhode Island. The woman driving this MERCEDES, by virture of this special license plate, is a Rhode Island state representative. Where we gassed up right near the highway (well, Route 37, close enough), was a nice shiny black BMW CONVERTIBLE with (again) a state representative's license plate! Here we are with some of the highest taxes in the country, and we have legislators who are driving these nice European hot rods while I'm financing a used American-made minivan that is nine years old and has 130,000 miles on it! I should also mind you that in Rhode Island, a state legislator is only a PART-TIME position. Talk about holier-than-thou! Serve your state part-time, screw it up, and drive a nice hot rod. It's nice to know what our taxes are REALLY paying for, eh?